The recreational use of 3,4-methylenedioxymethamphetamine (MDMA; Ecstasy) is often characterized by a repeated pattern of frequent drug administrations (binge) followed by a period of abstinence. Radiotelemetry was used to characterize the cardiovascular responses elicited during three MDMA binges (3 or 9 mg/kg b.i.d. for 4 days), each of which was separated by a 10-day MDMA-free period. The heart rate and mean arterial pressure (MAP) responses elicited by 3-mg/kg doses of MDMA were consistent within and between the three binges. In the first binge the 9-mg/kg doses of MDMA increased MAP and produced a biphasic (decrease/increase) heart rate response. 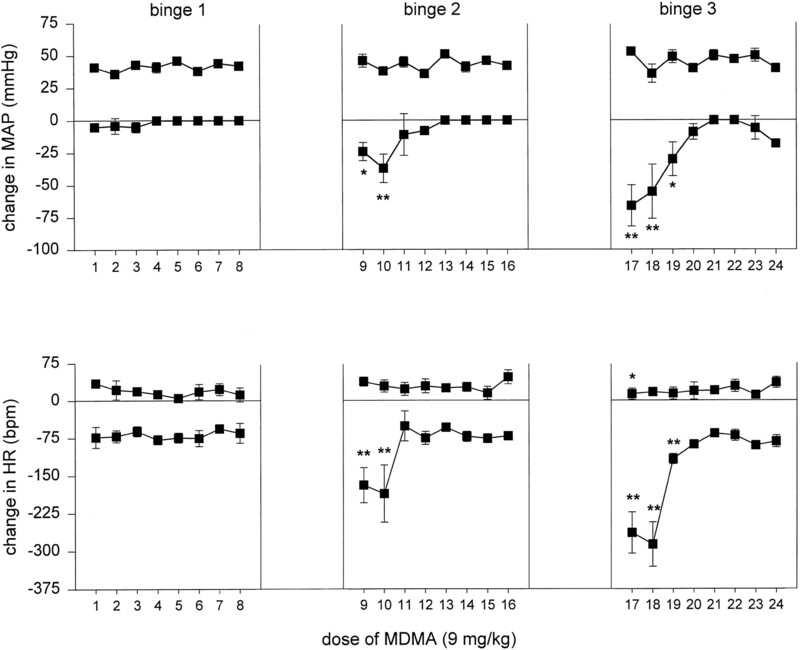 The bradycardia elicited by MDMA in the first binge (−75 bpm) was enhanced in the second and third binges (−186 and −287 bpm, respectively). Significant hypotension accompanied the increased bradycardic responses. Atropine abolished the hypotension and significantly attenuated the bradycardic responses. The MAP and heart rate responses elicited by sodium nitroprusside, acetylcholine, phenylephrine, and serotonin (5-HT) were evaluated before each binge and 10 days after the last binge. The hypotension, but not the tachycardia elicited by sodium nitroprusside was attenuated by the repeated administration of MDMA. The responses to phenylephrine, acetylcholine, and 5-HT were unaltered after MDMA. The hearts of treated rats contained foci of inflammatory infiltrates (lymphocytes and macrophages), some of which contained necrotic cells and/or disrupted cytoarchitecture. MDMA produced cardiac arrhythmias in some rats. These results indicate that the binge administration of MDMA can significantly alter cardiovascular and cardiovascular reflex function and produce cardiac toxicity. The recreational use of 3,4-methylenedioxymethamphetamine (MDMA; Ecstacy) has increased dramatically during the past several years, fueled at least in part by the popular belief that this drug does not produce serious toxicity. However, mounting experimental and clinical data indicate that MDMA can produce significant toxicity. MDMA is neurotoxic, especially to serotonergic systems in the brains of several species, including nonhuman primates (Commins et al., 1987; Ricaurte and McCann, 1992; Mas et al., 1999). MDMA abuse has also been associated with cognitive deficits such as memory impairment (Morgan, 2000; Zakzanis and Young, 2001). Emergency room and autopsy reports have also linked MDMA use and cardiovascular toxicity (Dowling et al., 1987; Milroy et al., 1996; Burgess et al., 2000). In spite of its potential to produce cardiovascular toxicity, the effects of MDMA on cardiovascular function, especially during chronic use, are limited. MDMA, like other amphetamines, increases the endogenous and stimulated release of peripheral monoamines (Fitzgerald and Reid, 1994). MDMA causes the efflux of 5-HT and to a lesser extent dopamine and norepinephrine by an exchange diffusion process involving the respective transmitter transport carriers (Kuczenski and Segal, 1994). The acute administration of MDMA increases arterial pressure, heart rate, and body temperature in humans (Green et al., 1995; Mas et al., 1999). In conscious rats, the acute i.v. administration of MDMA elicits dose-related arterial pressure and heart rate responses that are very similar to those elicited by amphetamine (O'Cain et al., 2000; McDaid and Docherty, 2001). In rats, the pressor responses elicited by MDMA involve the activation of α-adrenergic and serotonergic 5-HT2 type receptors (McDaid and Docherty, 2001). A typical pattern of recreational MDMA use involves the ingestion of one or several doses over a period of a few days (weekend) followed by a period of abstinence lasting days or weeks. This “binge” pattern of use is often repeated (McCann and Ricaurte, 1994). The cardiovascular responses elicited during this pattern of chronic MDMA use have not been studied. In rats, the binge administration of methamphetamine sensitizes rats to the pressor effects of the drug (Varner et al., 2002). The binge administration of methamphetamine also decreases the sensitivity of the rats to the blood pressure-lowering actions of several vasodilators by an undetermined mechanism, and alters the pattern of vasovagal heart rate reflex responses elicited by the i.v. administration of 5-HT (Varner et al., 2002). This pattern of methamphetamine administration also produces significant cardiac pathology. Given the similarities in the pharmacology of MDMA and methamphetamine, we hypothesized that the binge administration of MDMA would produce changes in cardiovascular and cardiovascular reflex function similar to those produced by the binge administration of methamphetamine. We also hypothesized that the binge administration of MDMA, like methamphetamine, would produce cardiac toxicity. Therefore, this study was designed to characterize the pattern of cardiovascular responses elicited during several binge administrations of MDMA. The MAP and heart rate responses elicited by the i.v. administration of various vasoactive drugs were also assessed before each of three MDMA binges and after the last binge. Finally, the potential for the binge administration of MDMA to produce cardiac toxicity was evaluated. Experiments were performed using male Sprague-Dawley rats (300 ± 12 g; Harlan, Indianapolis, IN). All procedures were in accordance with National Institutes of Health Guidelines for the Care and Use of Experimental Animals and were approved by the Institutional Animal Care and Use Committee at Louisiana State University Health Sciences Center. Before surgery the rats were group housed in a temperature- and humidity-controlled room with a 12-h light/dark cycle. After surgery the animals were housed individually. Standard rat chow and tap water were available ad libitum. During all surgical procedures the rats were anesthetized using methohexital sodium (75 mg/kg i.p.). Anesthesia was supplemented as indicated by spontaneous changes in respiration, cardiovascular parameters, and/or movement in response to tail or foot pinch. Mean arterial pressure (MAP) and heart rate were measured in conscious, freely moving rats in their home cages using a radio telemetry system (Dataquest A.R.T. 2.0; Data Sciences International, St. Paul, MN). The battery-operated telemetry probe (TL11M2-C50-PXT) contained an arterial catheter, a pressure transducer, and two wire leads for measuring the ECG. Under methohexital sodium anesthesia the arterial catheter was inserted into the descending aorta just rostral to the femoral bifurcation. The ECG leads were tunneled subcutaneously across the chest and placed in a modified lead II configuration, with one lead placed immediately caudal to the right clavicle and the other lead approximately 1 cm left of the xyphoid process. The body of the telemetry probe was then placed in the abdominal cavity and sutured to the abdominal musculature. A polyurethane venous cannula (Micro-renathane, 0.33-inch o.d. × 0.014-inch i.d. ; Braintree Scientific, Braintree, MA) was placed in the femoral vein. The free end of the venous cannula was tunneled subcutaneously to the nape of the neck and exteriorized. The rats (n = 14) were instrumented with a telemetry probe 7 to 10 days before the start of the experiment. The day before the experiment, the rats were randomly divided into two groups of seven animals and baseline MAP, heart rate, and ECG were recorded for 30 to 45 min. Each group of rats was then given bolus doses of acetylcholine (6 μg/kg), phenylephrine (9 μg/kg), sodium nitroprusside (45 μg/kg), and 5-HT (10 and 20 μg/kg). Acetylcholine and phenylephrine were used to determine whether prolonged exposure to the sympathomimetic actions of MDMA would alter muscarinic and/or α-adrenergic receptor-mediated cardiovascular responses. Sodium nitroprusside was used to determine whether repeated exposure to MDMA would alter a nonreceptor-mediated vasodilatory response. 5-HT was used to activate the vasovagal Bezold-Jarisch reflex. After each dose the cardiovascular parameters were allowed to return to baseline levels before administering the next test drug. The next day at 9:00 AM the first MDMA binge began. After recording baseline MAP, heart rate, and ECG for 30 to 45 min, one group of rats was given an i.v. dose of 3 mg/kg MDMA and the other group was given an i.v. dose of 9 mg/kg MDMA. Injections of MDMA (28–34 μl with 100 μl of saline flush) were made over 10 to 15 s. MAP, heart rate, and ECG were recorded for 1 h after administering MDMA. At approximately 4:00 PM the rats were given a second dose of MDMA and the cardiovascular parameters recorded for 1 h. The dosing schedule was repeated on each of the next 3 days. The first 4-day MDMA binge was followed by 10 MDMA-free days. This schedule of 4 days of treatment with MDMA followed by 10 MDMA-free days was repeated twice more. The day before the start of the second and third binges, and 10 days after the third binge, baseline MAP, heart rate, and ECG were recorded, and the MAP and heart rate responses to the i.v. 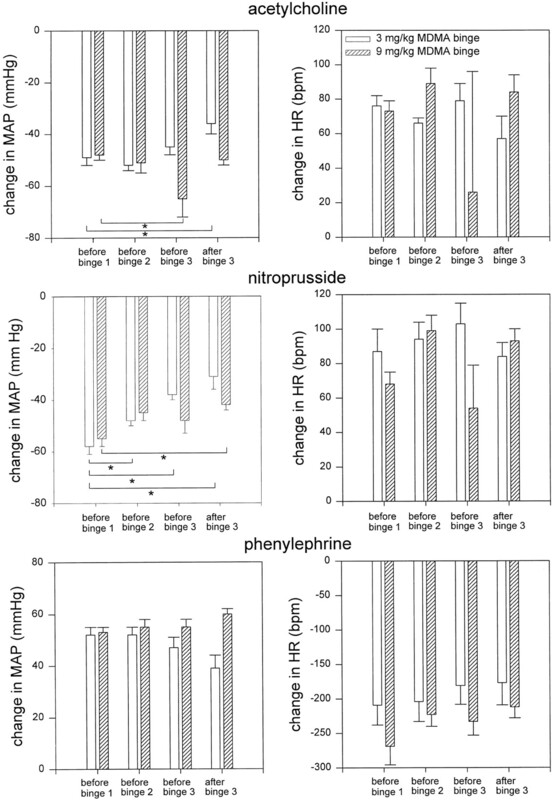 administration of phenylephrine, sodium nitroprusside, acetylcholine, and 5-HT reassessed. Eleven days after the third binge, the group of rats treated with 9 mg/kg MDMA (n = 7) was given the muscarinic receptor antagonist atropine (1 mg/kg i.v. ), followed 10 min later by MDMA (9 mg/kg). A separate control group in which saline was administered according the binge schedule was not used in this study. We previously reported that the binge administration of saline (three binges) did not alter baseline MAP and heart rate, nor did it alter the MAP and heart rate responses elicited by phenylephrine, sodium nitroprusside, acetylcholine, or 5-HT (Varner et al., 2002). The output from the telemetry probes (frequency in Hertz) was recorded by a receiver placed under the home cage. The data were then sent to a consolidation matrix before being stored on a personal computer. Data acquisition was controlled using Data Sciences International Dataquest acquisition software. During the experiments MAP, heart rate, and ECG data were continuously collected at 500 Hz. Data were then averaged into 2-s bins and displayed. Baseline and the peak MAP and heart rate responses elicited by drug administration were calculated using the Data Sciences International Dataquest analysis program. Baseline values of MAP and heart rate were compared using a one-way repeated measures analysis of variance (rmANOVA). The MAP and heart rate responses elicited by MDMA within and between binges were compared using 2-way rmANOVA. The peak MAP and heart rate responses elicited by the i.v. administration of acetylcholine, phenylephrine, sodium nitroprusside and 5-HT at various time points were compared using 1-way rmANOVA. After all ANOVAs, the differences between individual means were evaluated using Student-Newman-Keuls tests. The MAP and heart rate responses elicited by MDMA before and after the administration of atropine were compared using Student's t tests. The ECG records were examined in each rat before and after 1) the first dose of MDMA in the first binge, 2) the first and eighth (last) doses of MDMA in the second and third binges, and 3) atropine treatment (11 days after the third binge). The computer records of ECG activity, 20 min before and 60 min after, the administration of MDMA were visually inspected by two independent investigators for evidence of abnormal cardiac activity. A separate group of rats (n = 14) had a chronic venous cannula implanted in the femoral vein under methohexital sodium anesthesia. Different rats were used for these studies to reduce the possibility that the drugs used to test cardiovascular responsiveness would produce histological changes in the myocardium independent of MDMA. After 2 to 3 days of recovery, eight of the rats were given MDMA (9 mg/kg i.v.) using the binge schedule described above, whereas the remaining six rats were given injections of saline according to same schedule. One day after the first binge, four MDMA- and three saline-treated rats were deeply anesthetized using halothane and the hearts quickly removed. The remaining four MDMA- and three saline-treated rats were subjected to two more MDMA binges. One day after the third binge these rats were sacrificed and the hearts removed. All excised hearts were perfused retrogradely through the aorta with phosphate-buffered saline followed by 10% zinc-formalin. The perfused hearts were cut horizontally into four sections (one basal, two midventricular, and one apical) and fixed for 4 to 6 h in 10% zinc-formalin. These gross sections were processed, embedded in paraffin, and sectioned at 2 μm. These histological sections were placed on glass slides and alternate sections were stained with Mason's trichrome and hematoxylin-eosin. All slides were examined blind by the same pathologist. Four hematoxylin-eosin-stained histological sections were studied from each heart, one from each gross section. Inflammation was diagnosed on hematoxylin-eosin slides by the accumulation of mononuclear and polymorphonuclear inflammatory cells. The inflammatory infiltration was classified as grade 1 or grade 2, using a grading scale adapted fromBillingham et al. (1990). Inflammatory foci were graded 1 when three more inflammatory cells (exclusive of mast cells) were present in the interstitium or around blood vessels, without distortion of myocardial fibers (Fig. 7A). Lesions were graded 2 when inflammatory infiltrate was associated with a disruption of the normal architecture and/or necrotic myofibrils (Fig. 7B). Necrotic cells were identified by the absence of a nucleus and the loss of cytoplasmic striations (Fig. 7C). Interstitial fibrosis was investigated on slides stained with Mason's trichrome, in which fibrotic areas stain blue against the red muscle. The number of lesions in treated and control rats at each time point was counted and the results compared using Student's ttests. The total number of lesions in control and treated rats at each time point was also compared using t tests. Photomicrographs (original magnification, 400× each) showing examples of cardiac toxicity produced after three binge administrations of MDMA (9 mg/kg i.v.). A, grade 1 lesion showing inflammatory cells (arrows) surrounding myocytes without a disruption of the cytoarchitecture (hematoxylin-eosin). B, grade 2 lesion showing a focus of inflammation (arrows) with disrupted cytoarchitecture (hematoxylin-eosin). C, grade 2 lesion with inflammation (arrowhead) and necrosis (arrow) (hematoxylin-eosin). D, grade 1 lesion containing lymphocytes (brown staining; CD45). E, grade 2 lesion containing macrophages and monocytes (brown staining; ED1). F, grade 2 lesion containing lymphocytes (brown staining; CD45). Horizontal calibration, 135 μm. Because interstitial cells can be difficult to characterize unequivocally on hematoxylin-eosin stained slides, cells present in the inflammatory foci were further identified by immunohistochemistry on additional histological sections (4-μm) stained with monoclonal antibodies. Lymphocytes were identified by the leukocyte common antigen CD45 (OX-1; BD PharMingen, San Jose, CA). Rat tissue macrophages/monocytes and myeloid cells were identified by ED1 (MCA341R and Starr 77, MCA 341R; Serotec, Raleigh, NC). Positively stained cells were identified by a brown granular pigmentation of the cytoplasm. As a positive control, each group of slides included histological sections of rat intestine and spleen. Negative controls consisted of histological sections of tissue incubated without the primary antibody. The drugs used in this study were (+)-3,4-methylenedioxymethamphetamine HCl (Research Technology Branch, National Institute on Drug Abuse, Bethesda, MD), phenylephrine HCl, acetylcholine, sodium nitroprusside, serotonin HCl (all from Sigma-Aldrich, St. Louis, MO), and methohexital sodium (Brevital; Jones Pharma, St. Louis, MO). Cardiovascular Responses Elicited by MDMA. 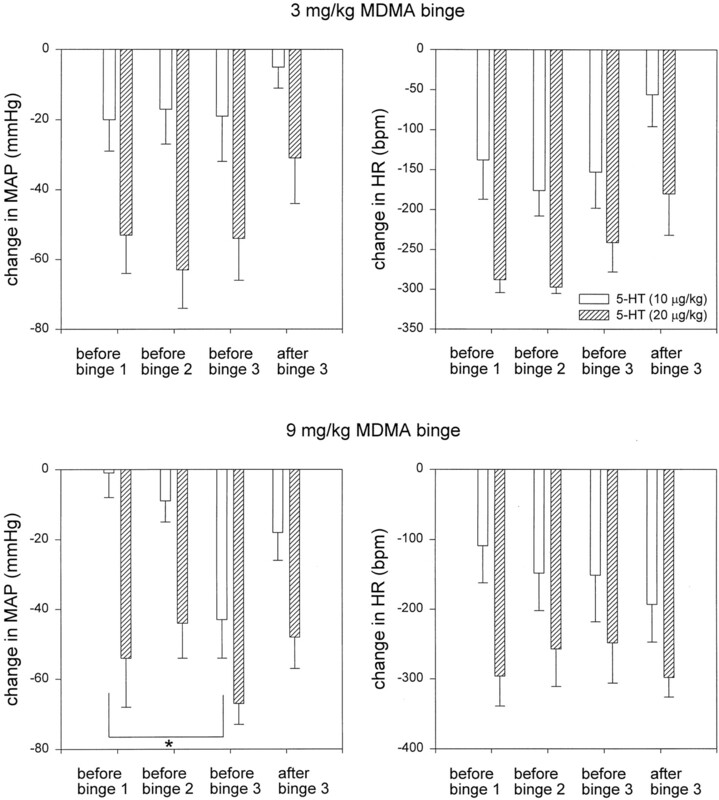 In both groups of rats, there were no significant differences in the resting levels of MAP or heart rate before each of the three MDMA binges or 10 days after the third binge (Table 1). In the first binge, the i.v. administration of 3 or 9 mg/kg MDMA increased MAP and produced a biphasic heart rate response consisting of an initial bradycardia followed by tachycardia (Fig.1A). Figure2 summarizes the MAP and heart rate responses elicited by each 3-mg/kg dose of MDMA within each of the three binges. Within the first binge, all doses of MDMA elicited similar pressor responses. The magnitudes of the pressor responses were also similar across all three binges. The only exceptions were the second doses in the second and third binges, which were significantly larger (p = 0.008 and p = 0.026, respectively) than the corresponding dose in the first binge (Fig. 2). The magnitudes of the initial bradycardic responses elicited by the 3-mg/kg dose of MDMA were similar within and between the three binges (Fig. 2). 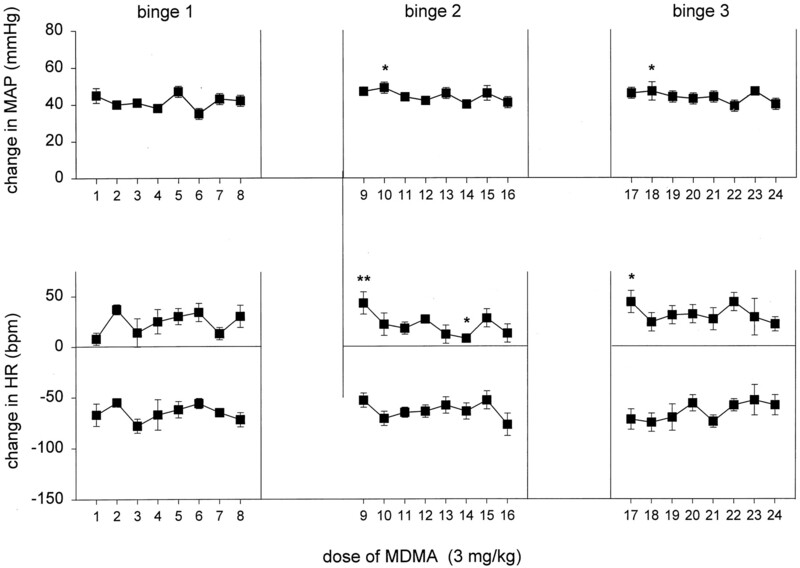 However, the subsequent tachycardic responses elicited by the first dose of MDMA in the second and third binges were significantly greater (p = 0.004 and p = 0.007, respectively) than that elicited by the first dose in the first binge (Fig. 2). Typical examples of the mean arterial pressure (MAP) and heart rate (HR) responses elicited by the i.v. injection of MDMA (9 mg/kg). A, MAP and heart rate responses elicited by the first dose of MDMA in the first binge. B, MAP and heart rate responses elicited in the same rat by the first dose of MDMA in the third binge. Arrow denotes drug injection. Summary of the peak MAP and heart rate responses elicited by each dose of MDMA (3 mg/kg i.v.) in the first, second, and third binge. MDMA was administered twice daily for 4 days within each binge. Successive binges were separated by 10 drug-free days. Top, averages of the maximal changes in MAP (n = 7) elicited by each dose of MDMA. Bottom, averages of the maximal bradycardic and tachycardic components of the biphasic heart rate responses elicited by MDMA. Values are means ± S.E.M. ∗,p < 0.05; ∗∗, p < 0.005, significantly different from the response elicited by the corresponding dose in the first binge. The magnitudes of the pressor responses elicited by the 9-mg/kg doses of MDMA were very similar both within and between the binges (Fig.3). Within the first binge, the heart rate responses elicited by this dose of MDMA were consistent. However, in the second binge, the initial bradycardic response elicited by the first two doses of MDMA were significantly larger (p = 0.001 and p < 0.001, respectively) than those elicited by the corresponding doses in the first binge (Fig. 3). Compared with the first binge, the bradycardic responses were further increased (p < 0.001, p < 0.001, andp = 0.004, respectively) during the third binge (Figs.1B and 3). The large bradycardic responses in the second and third binges were accompanied by decreases in MAP that were significantly larger than those elicited in the first binge (p = 0.019, p < 0.001, and p < 0.001;p < 0.001; and p = 0.01, respectively) (Figs. 1B and 3). 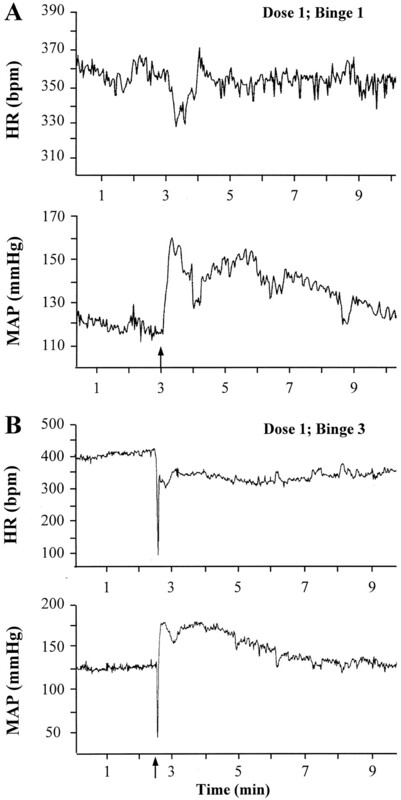 The dramatic change in the pattern of MAP and heart rate responses that occurred during binge dosing is clearly illustrated by the experimental records in Fig. 1. These tracings, taken from the same rat, show the MAP and heart rate responses elicited by the first dose of MDMA in the first (Fig. 1A) and third binges (Fig. 1B). Eleven days after the end of the third binge, pretreatment with atropine abolished the hypotensive- and significantly attenuated (p < 0.001) the bradycardic components of the responses elicited by the 9-mg/kg dose of MDMA (Fig.4). MDMA was not administered before giving atropine to avoid the development of tachyphylaxis. With one exception (dose 1; binge 3), the tachycardic component of the heart rate responses elicited by the 9-mg/kg dose of MDMA were similar within and between binges (Fig. 3). Summary of the peak MAP and heart rate responses elicited by each dose of MDMA (9 mg/kg i.v.) in the first, second, and third binge. MDMA was administered twice daily for 4 days within each binge. Successive binges were separated by 10 drug-free days. Top, averages of the maximal changes in MAP (n = 7) elicited by each dose of MDMA. Bottom, averages of the maximal bradycardic and tachycardic components of the biphasic heart rate responses elicited by MDMA. Values are means ± S.E.M. ∗,p < 0.05; ∗∗, p < 0.005, significantly different from the response elicited by the corresponding dose in the first binge. Effect of atropine on the MAP and heart rate responses elicited by MDMA. The first dose of MDMA (9 mg/kg i.v. ;n = 7) in the third binge (solid columns) decreased both MAP (left) and heart rate (right). Eleven days after the third binge (open columns), pretreatment with atropine (1.0 mg/kg) abolished the decrease in MAP and significantly attenuated the fall in heart rate elicited by the administration of MDMA. Values are means ± S.E.M. ∗∗, p < 0.005, significantly different from the response elicited by dose 1, binge 3. Before administering the first dose of MDMA (9 mg/kg) in the first binge, there were no detectable arrhythmias in any of the rats. In four of the seven rats, each dose of MDMA, irrespective of binge was immediately followed by the appearance of 7 to 10 extrasystoles/min that lasted for approximately 3 min. Administration of MDMA also produced brief (10–15-s) periods of sinus pause/heart block characterized by brief periods of ventricular asystole with and without P waves. Sinus pause occurred in two of seven rats after administering the first dose of MDMA in the first binge. In the second and third binges, the first dose of MDMA elicited sinus pause in five of seven rats. These episodes of sinus pause were coincident with the large bradycardic and hypotensive responses elicited by these doses (Figs. 1and 3). After administering the last doses of MDMA in binges 2 and 3, sinus pause was only detected in one rat each. No episodes of sinus pause were elicited by MDMA after pretreatment with atropine. The administration of MDMA also produced apparent ST segment depression. After the first dose of MDMA in the first binge, ST segment depression was observed in one of seven rats. In the second binge, the first and eighth doses of MDMA each elicited ST segment changes in three rats. By the start of the third binge, three of the rats had ST segment changes before the administration of MDMA. The first and eighth doses of MDMA in the third binge produced ST segment changes in four and five rats, respectively. Figure 5 summarizes the MAP and heart rate responses elicited by the i.v. administration of acetylcholine, sodium nitroprusside, and phenylephrine in both treatment groups 1 day before the start of the first, second, and third binges and 10 days after the third binge. In the rats given the 3-mg/kg dose of MDMA, there was a progressive reduction in the magnitude of the depressor response elicited by sodium nitroprusside. There was also a tendency for the magnitude of the depressor responses elicited by sodium nitroprusside to decrease in rats treated with the 9-mg/kg dose; however, the decrease in the MAP response was only significant (p = 0.016) 10 days after the third binge. The heart rate responses elicited by sodium nitroprusside in both groups of rats were not different at any of the time points tested. In the rats treated with 3 mg/kg MDMA, the magnitude of the depressor response elicited by acetylcholine was also significantly reduced (p = 0.048) 10 days after the last binge (Fig. 5). However, in the rats given the 9-mg/kg dose of MDMA, the magnitude of the depressor response elicited by acetylcholine was significantly greater (p = 0.01) 1 day before the third binge (Fig.5). The heart rate responses elicited by acetylcholine were similar in both groups of rats at all time points (Fig. 5). In both treatment groups, the pressor and bradycardic responses elicited by phenylephrine were not altered by treatment with MDMA (Fig. 5). Summary of the peak MAP and heart rate responses elicited by the i.v. administration of acetylcholine (6 μg/kg), sodium nitroprusside (45 μg/kg), and phenylephrine (9 μg/kg) 1 day before each MDMA binge and 10 days after the third binge. The rats were treated with either 3 mg/kg (n = 7) or 9 mg/kg (n = 7) MDMA. Values are means ± S.E.M. ∗,p < 0.05, significantly different from response before binge 1. The i.v. injection of 10 or 20 μg/kg 5-HT simultaneously decreased MAP and heart rate. The magnitudes of the peak decreases in MAP and heart rate elicited by each dose of 5-HT were similar at all of the time points tested (Fig. 6). The only exception was the significantly larger (p = 0.005) hypotensive response elicited by the 10-μg/kg dose of 5-HT before the third binge in rats treated with the 9 mg/kg MDMA (Fig. 6). The corresponding heart rate response elicited by this dose of 5-HT was not significantly altered. Summary of the peak MAP and heart rate responses elicited by i.v. 5-HT (10 or 20 μg/kg) in conscious rats subjected to the binge administration of 3 or 9 mg/kg (n = 7 each) MDMA. ∗, p < 0.05, significantly different from response before binge 1. The hearts of rats exposed to 1 MDMA binge exhibited a small number of grade 1 and grade 2 lesions; however, the number of lesions in the MDMA-treated rats was not significantly different than in saline-treated control rats (Table 2). In contrast, the hearts of rats exposed to three MDMA binges contained significantly more (p = 0.004 and p = 0.046, respectively) grade 1 and grade 2 lesions (Fig.7, A and B) than did the hearts from control rats (Table 2). The total number of lesions in the rats treated with three MDMA binges was also significantly greater (p < 0.001) than in control rats (Table 2). The inflammatory lesions in these MDMA-treated rats were multifocal and distributed throughout the myocardium of both ventricles. Inflammatory foci contained abundant lymphocytes (Fig. 7, D and F) intermingled with macrophages (Fig. 7E). Necrosis was observed in some grade 2 lesions (Fig. 7C). Mast cells were evenly distributed throughout the myocardium in control and experimental rats. Distinct areas of fibrosis were not observed. To our knowledge, this is the first study to characterize the cardiovascular and cardiovascular reflex responses elicited by the binge administration of MDMA. Ricaurte and McCann (1992) have reported that primates and perhaps humans are 2 to 4 times more sensitive to the neurotoxic effects of MDMA than are rats. Therefore, the 3-mg/kg dose of MDMA used in this study is within the range of recreational doses taken by humans (Ricaurte and McCann, 1992). The 9-mg/kg dose of MDMA was used because it is within the range of doses producing neurotoxicity in rats (Battaglia et al., 1987; Commins et al., 1987) and should also have been equivalent to a neurotoxic dose in primates (Ricaurte and McCann, 1992). Within the first binge, the administration of either dose of MDMA elicited pressor responses and biphasic (decreases then increases) heart rate responses. The binge administration of methamphetamine produces a similar pattern of MAP and heart rate responses (Varner et al., 2002). Although MDMA is usually discussed with respect to its selective actions on serotonergic and to some extent dopaminergic and noradrenergic systems in the brain, MDMA has sympathomimetic actions in the periphery in vitro (Fitzgerald and Reid, 1994) and in vivo (O'Cain et al., 2000; McDaid and Docherty, 2001). The magnitude of the MAP and heart rate responses elicited by the 3- and 9-mg/kg doses were consistent within the first binge, indicating that significant tachyphylaxis did not develop during the twice daily dosing. With minor exceptions, the pressor and tachycardic components of the responses elicited by either dose of MDMA were also remarkably stable between binges, indicating that sensitization to the pressor and heart rate-increasing actions of MDMA did not occur. In contrast, this laboratory and others have shown that sensitization develops to the pressor actions of methamphetamine during binge or intermittent administration (Yoshida et al., 1993; Varner et al., 2002). In stark contrast to the uniform pressor and tachycardic responses between binges, there were dramatic increases in the magnitude of the bradycardic responses elicited by the 9-mg/kg dose of MDMA at the start of the second and third binges. The enhanced bradycardic responses were accompanied by large decreases in MAP that most likely resulted from a decrease in cardiac output, but may have also included a decrease in sympathetic nerve activity. The pattern of MAP and heart rate responses elicited by the first few doses of MDMA in the second and third binges resembled that produced by vasovagal reflex activation (O'Cain et al., 2000). The ability of atropine to block the hypotension and attenuate the decreases in heart rate elicited by MDMA confirms that these responses were vagally mediated. Intense vagal activation could also account for the periods of sinus pause and heart block that coincided with the bradycardic and hypotensive responses. The question of how MDMA activates the vasovagal heart rate reflex during the course of binge administration is unanswered. MDMA may produce vagal activation by an action on a central nervous system component(s) of the reflex. Whether the increased sensitivity of the central components of the reflex arc reflects changes in receptor type, sensitivity, or number remains to be determined. The increase in reflex sensitivity may also reflect disinhibition of the reflex resulting from the neurotoxic actions of MDMA. The 9-mg/kg dose is within the range of doses reported to produce serotonergic neurotoxicity in rats (Battaglia et al., 1987). We previously showed that administration of neurotoxic doses of MDMA (20 mg/kg b.i.d., for 4 days) to rats significantly increases the bradycardic response to i.v. 5-HT (O'Cain et al., 2000), suggesting that the destruction of central 5-HT-containing circuits can enhance vagal function. However, in the present study, the magnitude of the bradycardic response elicited by i.v. 5-HT was not altered after any of the binges. The reason for these contradictory results is unclear, but may be related to the size of the dose used in each study and the degree of neurotoxicity produced. It is also possible that the large bradycardic and hypotensive responses were produced by the MDMA-mediated release of 5-HT from peripheral stores. This release most likely would come from the enterochromaffin cells in the gastrointestinal tract or blood platelets, both of which contain high concentrations of 5-HT. The effects of MDMA on peripheral 5-HT stores are currently being studied. To determine whether MDMA-mediated increases in monoamine levels could alter cardiovascular responsiveness, the MAP and heart rate responses elicited by phenylephrine, sodium nitroprusside, acetylcholine, and 5-HT were examined before each binge and 10 days after the last binge. As dosing with MDMA progressed, there was a progressive decrease in sensitivity to the depressor actions of sodium nitroprusside and a trend toward a decrease in sensitivity to the depressor actions of acetylcholine. In contrast, the binge administration of methamphetamine decreased the magnitude of the hypotensive responses elicited by sodium nitroprusside, acetylcholine, and isoproterenol (Varner et al., 2002). Although the exact mechanism(s) responsible for the decrease in sensitivity to the depressor actions of the vasodilators after methamphetamine is unknown, vascular remodeling may play a role (Varner et al., 2002). The binge administration of MDMA did not alter the MAP or heart rate responses elicited by 5-HT. In contrast, after the binge administration of methamphetamine, the depressor response to 5-HT was converted to a pressor response and the bradycardic response was virtually eliminated (Varner et al., 2002). The reason for the differential effects of MDMA and methamphetamine on the MAP and heart rate responses to 5-HT are currently being studied. The MAP and heart rate responses elicited by phenylephrine were not altered by the binge administration of MDMA or methamphetamine (Varner et al., 2002). To our knowledge, this is the first report showing that the binge administration of MDMA can produce toxic myocarditis consisting of multiple foci of inflammation in both ventricles, with and without obvious necrosis. The inflammatory infiltrate was predominantly lymphocytic with lesser numbers of monocytes. The degree of cardiac toxicity observed was proportional to the number of doses administered. The incidence of ST segment depression in the ECG also increased as the dosing progressed. Depression of the ST segment is often reflective of myocardial ischemia (Mirvis, 1993), as are the types of cardiac pathology (e.g., necrosis) observed in our rats. Myocarditis has been described in human deaths associated with Ecstasy (Milroy et al., 1996). MDMA has also been reported to produce cardiac arrhythmia in humans (Dowling et al., 1987; Burgess et al., 2000). The pattern of cardiac pathology produced by the binge administration of MDMA was very similar to that produced by the binge administration of methamphetamine (Varner et al., 2002). The mechanism(s) responsible for the cardiotoxic actions of MDMA are unknown. Because MDMA and methamphetamine both have sympathomimetic properties and produce similar patterns of cardiac toxicity, it would seem logical to suggest that both drugs produce cardiac toxicity by similar mechanism(s). However, such a generalization is dangerous given the substantial differences in the cardiovascular responses elicited by the two drugs and the fact that the mechanism(s) responsible for methamphetamine-induced cardiotoxicity is largely unknown. One proposed mechanism suggests that increased catecholaminergic stimulation is responsible for the methamphetamine cardiotoxicity (Jiang and Downing, 1990). Catecholaminergic stimulation can produce myocardial necrosis and infiltration (Downing and Chen, 1985; Simons and Downing, 1985;Jiang and Downing, 1990) by mechanisms as diverse as 1) ischemia due to coronary vasoconstriction, 2) calcium overload, and 3) the production of oxygen free radicals by either the autooxidation of catecholamines or their degradation by monoamine oxygenase. Reactive oxygen species may also be produced by catecholamine degradation, mitochondrial dysfunction, leukocyte activation, and/or xanthine oxidization during reperfusion ischemia (Jiang and Downing, 1990). MDMA may also damage myocytes by a direct action. Methamphetamine is toxic to myocytes in culture systems devoid of catecholamines (Welder, 1992; He, 1995). MDMA may also damage cardiac cells by initiating apoptosis. Apoptotic processes occur in several types of cardiac pathology (Song et al., 1999; Webster et al., 1999; Oskarsson et al., 2000; Xie et al., 2000). In conclusion, these studies have shown that the binge administration of MDMA can significantly alter cardiovascular function. After repeated dosing, the pattern of MAP and heart rate responses elicited by MDMA changes from that typically elicited by a sympathomimetic stimulant, to one resembling vasovagal reflex activation. There is also a gradual reduction in the sensitivity to the depressor actions of sodium nitroprusside and to some extent acetylcholine. Over the course of several MDMA binges, there is an increased potential for MDMA to generate cardiac arrhythmias. Finally, the binge administration of MDMA produces myocarditis. These data indicate that MDMA has the potential to significantly alter cardiovascular function and produce potentially serious cardiovascular toxicity. We are grateful for the expert technical assistance of Helena Pappas-Lebeau. This work was supported by a grant from the National Institute on Drug Abuse (DA-08255). (1987) 3,4-Methylenedioxymethamphetamine and 3,4-methylenedioxyamphetamine destroy serotonin terminals in rat brain: quantification of neurodegeneration by measurement of (3H)paroxetine-labeled serotonin uptake sites. J Pharmacol Exp Ther 242:911–916. (1990) A working formulation for the standardization of nomenclature in the diagnosis of heart and lung rejection: heart rejections study group. International Society for Heart Transplantation. J Heart Trans 9:587–593. (2000) Agony and Ecstasy: a review of MDMA effects and toxicity. Eur Psychiatry 5:287–294. (1987) Biochemical and histological evidence that methylenedioxymethamphetamine (MDMA) is toxic to neurons in the rat brain. J Phamacol Exp Ther 241:338–345. (1987) ‘Eve’ and ‘Ecstasy’: a report of five deaths associated with the use of MDEA and MDMA. J Am Med Assoc 257:1615–1617. (1985) Myocardial injury following endogenous catecholamine release in rabbits. J Mol Cell Cardiol 17:377–387. (1994) Sympathomimetic actions of methylenedioxymethamphetamine in rat and rabbit isolated cardiovascular tissues. J Pharm Pharmacol 46:826–832. (1995) Review of the pharmacology and clinical pharmacology of 3, 4-methylenedioxymethamphetamine (MDMA or “Ecstasy”). Psychopharmacology 119:247–260. (1995) Methamphetamine-induced toxicity in cultured adult rat cardiomyocytes. Jpn J Legal Med 49:175–186. (1990) Catecholamine cardiomyopathy: review and analysis of pathogenetic mechanisms. Yale J Biol Med 63:581–591. (1994) Neurochemistry of amphetamine. in Amphetamine and Its Analogs, eds Cho AK, Segal DS (Academic Press, San Diego), pp 81–113. (1999) Cardiovascular and neuroendocrine effects and pharmacokinetics of 3,4-methylenedioxymethamphetamine in humans. J Pharmacol Exp Ther 290:136–145. (1994) Use and abuse of ring-substituted amphetamines. in Amphetamine and Its Analogs, eds Cho AK, Segal DS (Academic Press, San Diego), pp 371–386. (2001) Vascular actions of MDMA involve α1 and α2-adrenoceptors in the anaesthetized rat. Br J Pharmacol 133:429–437. (1996) Pathology of deaths associated with “ecstasy” and “eve” misuse. J Clin Pathol 49:149–153. (1993) Myocardial Ischemia. Electrocardiography: A Physiological Approach (Mosby, St. Louis), pp 177–191. (2000) Ecstasy (MDMA): a review of its possible persistent psychological effects. Psychopharmacologia 152:230–248. (2000) Cardiovascular and sympathetic responses and reflex changes elicited by MDMA. Physiol Behav 70:141–148. (2000) Antioxidants attenuate myocyte apoptosis in the remote non-infarcted myocardium following large myocardial infarction. Cardiovasc Res 45:679–687. (1992) Neurotoxic amphetamine analogues: effects in monkeys and implications for humans. Ann NY Acad Sci 648:371–382. (1985) Coronary vasoconstriction and catecholamine cardiomyopathy. Am Heart J 109:297–304. (1999) Increased p53 protein expression in human failing myocardium. J Heart Lung Trans 18:744–749. (2002) Cardiovascular responses elicited by the “binge” administration of methamphetamine. J Pharmacol Exp Ther 301:152–159. (1999) Hypoxia-activated apoptosis of cardiac myocytes requires reoxygenation or a pH shift and is independent of p53. J Clin Inv 104:239–252. (1992) A primary culture system of postnatal rat heart cells for the study of cocaine and methamphetamine toxicity. Toxicol Lett 60:183–196. 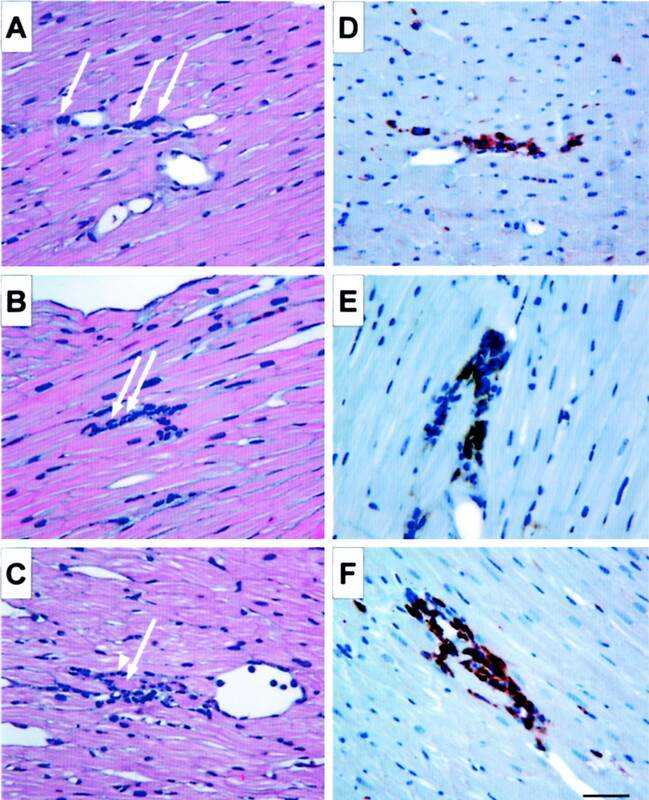 (2000) Upregulation of p53 protein in rat heart subjected to a transient occlusion of the coronary artery followed by reperfusion. Jpn J Physiol 50:159–162. (1993) Cardiovascular, thermal and behavioral sensitization to methamphetamine in freely moving rats. J Pharmacol Exp Ther 267:1538–1543. (2001) Memory impairment in abstinent MDMA (“Ecstasy”) users: a longitudinal investigation. Neurology 56:966–969.